Preface. Principles and Technologies for the Acquisition of Magnetic Data. General principles. Conversion of magnetic energy by sensors. Nature of the magnetic field and the Lorentz force. Methods and applications of magnetic field measurements. State of the art of magnetosensitive device technology. Solutions employing integrated and smart sensors. References. Galvanomagnetic Phenomena Used in Solid-State Sensors. Introduction. Conductivity of condensed matter in the crossed electric and magnetic fields. Hall effect. Magnetoresistance effect. Magnetodiode effect. Related effects. Coherent phenomena associated with superconductivity in condensed matter. References. Characteristics of Solid-State Magnetic Field Sensors. Introduction. Magnetosensor characteristics related to OUT(B)C. Magnetosensor characteristics related to OUT(C)B. Characteristics of the magnetosensor as a circuit element. References. Hall Sensors and Magnetoresistors. Introduction. Orthogonal Hall sensors. Parallel-field Hall sensors. Magnetoresistance sensors. References. Magnetodiode Sensors. Device structures, materials and operation of MD sensors. Effect of device parameters and temperature on the current-voltage characteristics of integrated MDs. Determination of the MD sensor magnetosensitivity. Influence of the magnetic field, device parameters, temperature and noise on MD sensor magnetosensitivity. MD sensor review. Concluding remarks. References. Bipolar Magnetotransistors and Related Sensors. General approach to BMT design. General principles of BMT operation. Device structures and operation of BMT sensors. Figures of merit of BMT sensors. Unijunction magnetotransistor sensors. Carrier-domain magnetometers. Concluding remarks. References. SQUID Sensors. The SQUID system. Noise characteristics and sensitivity of SQUIDs. DC SQUID sensors. RF SQUID sensors. Review of SQUID sensors. High-Tc SQUID sensors. SQUID gradiometer sensors. Concluding remarks. References. Functional Magnetic-Field Sensors. Functional multisensors. Functional gradiometer sensors. Magnetic-field vector sensors. Concluding remarks. References. Interface and Improvement of Solid-State Magnetosensor Characteristics. Biasing circuitry. Signal-processing electronics for solid-state magnetosensors. Magnetic flip-flop based sensors. Interfacing solid-state magnetic sensors with digital systems. Improvement of solid-state magnetosensor characteristics. Concluding remarks. References. Applications of Solid-State Magnetosensors. Measurement of the magnetic field. Measurement of the current, power and related electrical quantities. Measurement of nonelectrical and nonmagnetic quantities. References. Conclusion. Appendices. Magnetic terms and units. Important quantities and constants used in galvanomagnetism. Subject Index. I am profoundly convinced that notwithstanding the great progress made in solid-state magnetic sensors, they are as yet in their cloudless infancy, whereas there is still so much lying ahead in a world, unlimited in time and space ... Good Heavens! They are a whole Universe into themselves. So expounds the author in his preface to this second volume in the exciting new series, Handbook of Sensors and Actuators. The publication presents a balanced view of the overall progress made in the field, whilst summing up scientific achievements as the groundwork for further development. 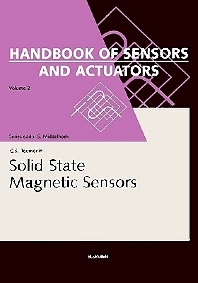 Readers will find, for the first time, collected in one book, detailed information regarding the physical mechanisms of the origin of magnetosensitivity, the geometry and design of devices, operating modes, basic parameters and methods for their determination, the incorporation of transducers in circuits and smart solutions, many varied applications and other problems relevant to all the current Hall sensors, magnetodiodes, magnetotransistors, carrier-domain magnetometers, SQUID's (Superconducting Quantum Interference Devices) and similar transducers of magnetic energy. Particular attention is devoted to semiconductor magnetosensitive sensors and their microelectronic versions since development rates in this area signify a dominant research trend for the future. Undoubtedly this book will become a vital reference tool for the ever widening circle of researchers and engineers interested in solid-state magnetosensors. It also makes a fundamental contribution to the handbook series as a whole.